Hover over the non-HubSpot form you want to convert and click the Actions dropdown menu, then select Convert to HubSpot form. 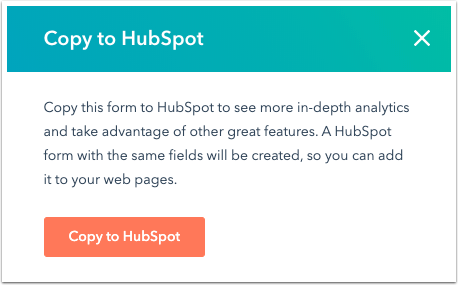 In the dialog box, click Copy to HubSpot to create a HubSpot form with all the same form fields. Once the HubSpot form is ready, you'll be redirected to the form editor where you can customize your form fields and options. The new HubSpot form can be identified by the word Converted in the title of your original form. The original non-HubSpot form will remain in your portal after making a copy.